Readers of this blog know that I have been describing changes in employment in New York State and the rust belt associated with the loss of manufacturing employment in the nation. The loss of 5,500,000 manufacturing jobs since 1970 has slowed employment growth in the region as a whole. 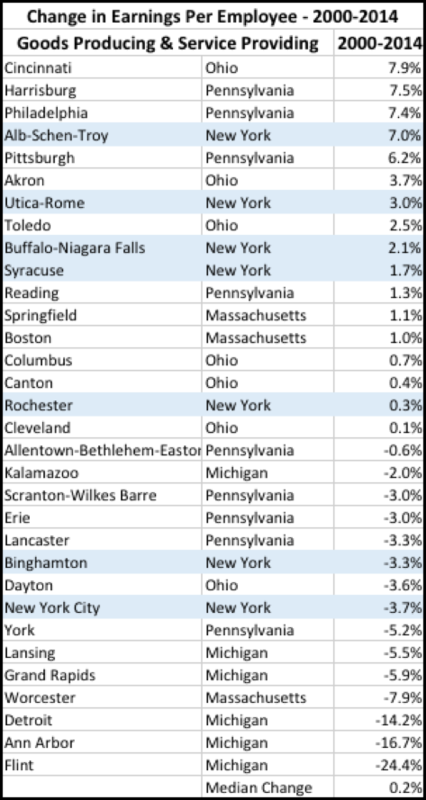 As a result, upstate cities, along with other small and medium sized cities in the rust belt have seen little overall job growth. The more significant impact for rust belt residents has been on employee earnings. Many metropolitan areas in the rust belt saw declining earnings per employee between 1970 and 2014. In one metropolitan area, Flint, Michigan, earnings per employee are nearly 33% lower than they were in 1970. 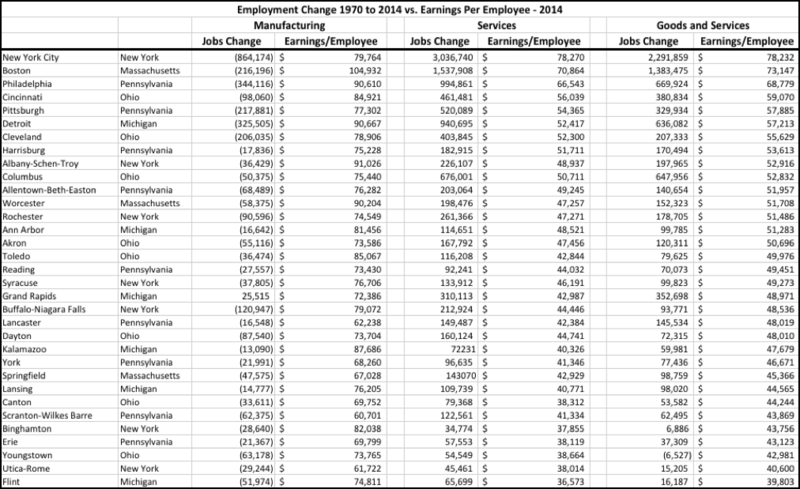 Ann Arbor, Binghamton, Lansing and Youngstown earnings per employee were more than 10% lower in 2014 than in 1970. In the most recent presidential election,we saw major shifts in voting patterns in traditionally Democratic voting rust belt states, with Donald Trump, the Republican presidential candidate, making large gains, particularly in smaller cities and rural areas. His gains have been portrayed as resulting from economic stagnation in the region. Commentators have highlighted the contrast between employment and income growth in more prosperous large, coastal cities like New York and stagnation in smaller communities. The data shows that while large cities in the rust belt saw significant growth in earnings per employee between 1970 and 2014, employees overall in medium and small metropolitan areas in the region had stagnant or declining earnings during the period. Earnings per employee in the Boston metropolitan area increased from $48,163 to $73,147 (52%) and New York City metropolitan earnings per employee increased by 40% from $55,923 to $78,232. 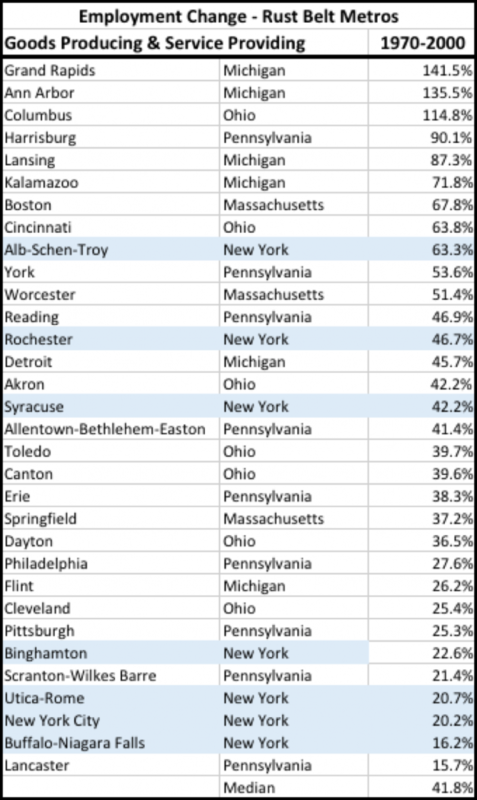 While large cities prospered, the median increase in real earnings per employee for the 32 Rust Belt metropolitan areas in New York, Massachusetts, Pennsylvania, Ohio and Michigan was only 2.2% over the entire 30 year period. Fourteen of 32 metropolitan areas saw decreases in earnings per employee over the 44 year period. Flint, Michigan had the second highest earnings per employee of the 32 metropolitan areas in 1970, and had the lowest in the group in 2014, decreasing by 33%. 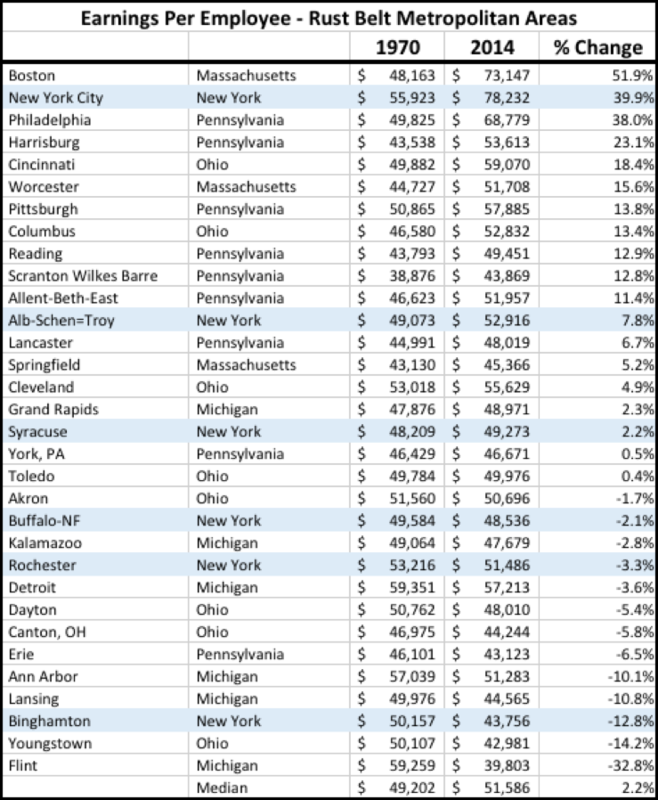 Earnings per employee in Youngstown, Ohio decreased from $50,107 to $42,981 – 14.2%. More recently, between 2000 and 2014, growth in earnings per employee in rust belt metropolitan areas between was virtually non-existent, overall – only 0.2%. Real earnings per employee declined in 15 of 32 metropolitan areas. Metropolitan areas in Michigan saw disastrous losses in earnings per employee because of problems in the automotive industry – Detroit lost 14%, Ann Arbor lost 17%, and Flint lost more than 24%. Although many rust belt metropolitan areas showed employment growth during the 1970 and 2000 period, growth between 2000 and 2014 was much weaker. Between 1970 and 2000, the median metropolitan area goods producing and service providing employment increased by 42%. 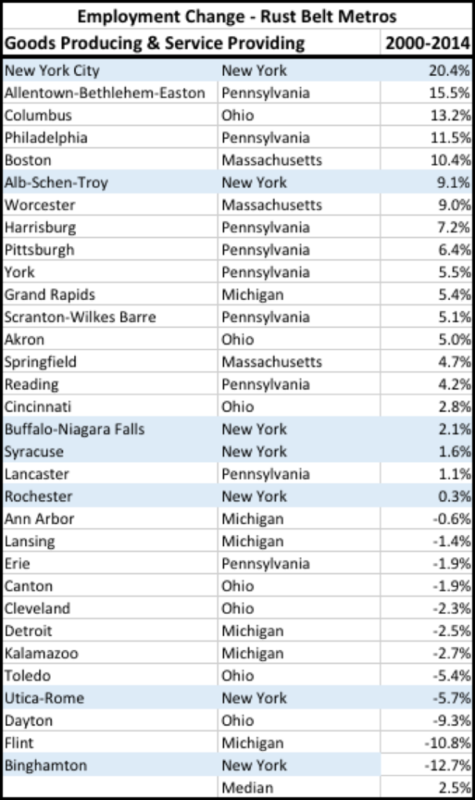 Cities in the heart of the rust belt, like Grand Rapids and Ann Arbor Michigan showed the largest employment increases, while several metropolitan areas in New York State, including Binghamton, New York City and Buffalo-Niagara Falls lagged. During the current century, between 2000 and 2014, median employment growth in rust belt metropolitan areas was only 2.5%. Twelve of 32 metropolitan areas saw losses in goods producing and service providing employment. Flint lost nearly 11% of jobs during the period, while Binghamton lost almost 13%. At the same time, some areas, including New York City, Philadelphia, Boston and Columbus saw employment growth of more than 10%. In some large cities – New York City, Boston and Philadelphia, despite the shift from manufacturing employment to services, earnings per employee have remained high – even increased. In these cities, earnings per service employee were relatively high in 2014- more than $65,000 in each case. But in many smaller cities, like average earnings per employee for service sector jobs averaged less than $40,000, compared with $60,000 to $80,000 per employee for manufacturing. Smaller cities were also harmed by the fact that in most cases, manufacturing employment losses were a higher percentage of total goods producing plus services providing employment. Overall, rust belt metropolitan areas have seen significant shifts in employment from substantially higher paying manufacturing jobs to lower paying service jobs. The Syracuse metropolitan area lost 37,800 manufacturing jobs between 1970 and 2014. Manufacturing jobs in Syracuse averaged $76,700 earnings per employee. The area gained 134,000 new service sector jobs, averaging $46,200. Many parts of the rust belt – particularly small and medium sized metropolitan areas – have not seen the prosperity enjoyed by large cities on the East and West coasts. Outside the major cities, the growth of real earnings per employee has been insignificant – typically about 2% over the 44 year period. Between 2000 and 2014 real earnings growth was virtually non-existent. Worse, 14 of 32 metropolitan areas saw decreases in real earnings per employee. Between 2000 and 2014, 15 metropolitan areas saw declines. Employment growth was substantially lower between 2000 and 2014 – typically 2.5% over the 14 year period, than the 42% increase in the 30 year period between 1970 and 2000. The region has endured a long period of economic stagnation, one that is largely the result of the loss of relatively high paying manufacturing jobs, and their replacement with lower paying service positions. The primary cause of the lackluster performance of medium and small metropolitan areas in the rust belt was their dependence on manufacturing. Because manufacturing was a larger share of medium and small rust belt metropolitan areas economies, automation and global markets resulted in larger job losses than in areas with more diversified economies. In some cases, residents of rust belt metropolitan areas are on average significantly worse off than they were in 1970. In most other metropolitan areas, earnings have stagnated for decades. The appeal of a Presidential candidate who promised to “Make America Great Again”, and to address perceived threats to rust belt residents’ well being with simple sounding solutions like imposing tariffs on foreign producers, and by controlling immigration from locations that are perceived to have taken jobs from workers in the rust belt should not be surprising. In contrast, many rust belt residents found that Secretary Clinton’s theme, “Stronger Together,” and policy positions lacked focus. The problem for the victorious candidate, however, is that ending the rust belt’s economic stagnation is likely to be more difficult than his proposed solutions suggest.